In our hearts, we have known all along that the greatest problem with Hillary and her heated rhetoric and the pathetic followers who mindlessly parrot every talking point and lash out at any person capable of free thought. Hillary seeks to insult and divide America in her reckless pursuit of power that can only be assumed to be another way to line her pockets for personal gain. Now, on top of the negative comments spewed by Hillary and her surrogates a Pew Poll demonstrates the way that same hate is reflected by her weak minded followers. Kind of ironic for a woman who called a former KKK leader a friend and mentor, but I digress. Next it came out that Democrat Operatives paid the the Hillary Campaign and the DNC, and with close ties to people like Robby Mook, were paying to send people to Trump events to start fights and create anarchy. This week, Hillary attacked Trump supporters again calling us all “Dark, Divisive and Dangerous.” This was in a screaming hate filled rant after a heckler dared interrupted the Queen. I am surprised she did not add “off with their heads!” It is also kind of funny that one heckler pushes her onto the crazy train, while her campaign has hired people to interrupt and create confrontations at Trump rallies. Following the lead of the woman who claims that we can only be “Stronger Together” while at the same time attacking and insulting her opposition, the mindless zombies that follow her are proving they are no better. 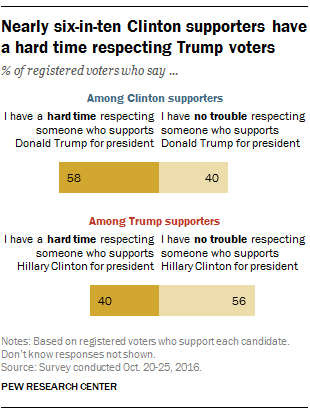 According to Pew research 58% of Hillary supporters are biased against Trump supporters. Only 40% or Trump supporters feel the same way. Interestingly, Hillary’s core base of White Women is even worse with 68% showing this bias. There are no polling numbers for weak men with low testosterone levels, here second largest demographic. Her highly vaunted “College Graduate” demographic is an equally distasteful group at 66% showing their intolerance. There are no break down as to how many of these “College Educated” have useful degrees like Engineer or Business versus Women’s Dance Theory or the least useful major of all Journalism.